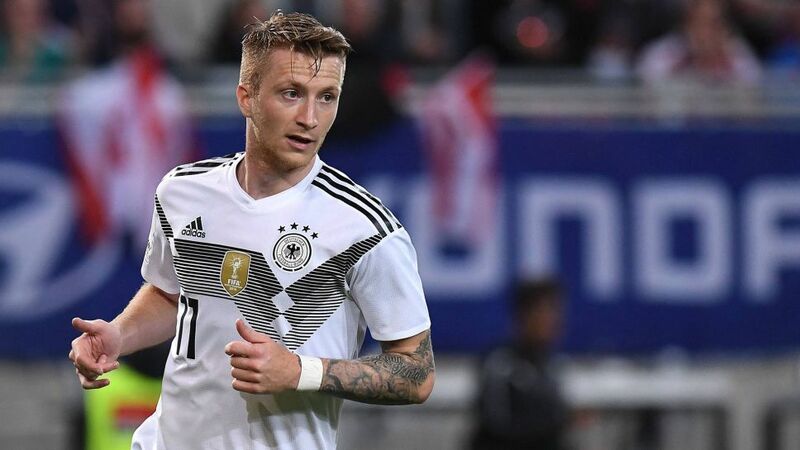 That a player as gifted as Borussia Dortmund's Marco Reus is featuring in only his first FIFA World Cup is something of a travesty. The attacking midfielder had to fight back from injury once again to give himself a chance at his dream, but now there, Reus will hope to have a significant say in proceedings. It's that simple. Why else would you pick a player in your World Cup squad? Well, with Reus, the statistics back up what could otherwise be just a judgment. After an injury-destroyed first half of the season, the 29-year-old enjoyed a renaissance in 2018, scoring seven goals in 11 games to help secure Dortmund UEFA Champions League football next season. His overall Bundesliga record for reads 233 games, 99 goals and 64 assists, hugely impressive numbers indeed. It isn't just his stats that deserve recognition, however. Reus is arguably Germany's most technically gifted footballer. He can strike a free-kick better than anyone and has scored eight times against Bayern Munich, five against Schalke and has bagged many a goal in the Champions League knockout rounds. Mentally, Reus has what it takes to excel. Reus may have spent most of his career on the wing or as an attacking midfielder, but with Michy Batshuayi's recent injury depriving Dortmund of an out-and-out striker, he has stepped up to the plate to show he can score as well as he can make goals. His most prolific season to date was his final one at Borussia Mönchengladbach in 2011/12, when the Foals cantered into the Champions League places with Reus playing up front beside Mike Hanke. Coach Lucien Favre usually employed a 4-4-2 formation and Reus was the focal point of the attack in 17 of his 32 appearances. He also played up front when he lifted his first major trophy – the 2017 DFB Cup – partnering Pierre-Emerick Aubameyang in the 2-1 win over Eintracht Frankfurt. Philipp Lahm was 30 when he captained Germany to World Cup glory four years ago; Cristiano Ronaldo was 31 when he led Portugal to glory at UEFA EURO 2016; the great Franz Beckenbauer was 28 when he won the World Cup in 1974; and Lothar Matthäus was 29 when he captained Germany to glory at Italia '90? Reus will have just turned 29 by the time the tournament kicks off on 14 June, and therefore entering his prime. He blends technical quality, mental strength and experience when he's on the field. Why wouldn't Löw avail himself of all that this summer? Two years later, a groin injury ended his dreams of being involved in UEFA EURO 2016, again only hours before the squad were due to depart. "He's an incredibly skilful and intelligent player, a real handful for the opposition," Löw said ahead of the Austria friendly. "Marco's like a rocket! I hope he comes through the next few weeks unscathed, then we can all look forward to seeing Marco at the World Cup." An appearance at another major tournament is the least this mercurial talent deserves.